And alive is how you will feel when you reach the top of Treble Cone in New Zealand’s Central Otago region. Zen-like vistas await from its 2,100 metre summit. The mountains rise straight up from Lake Wanaka and valley floor ,beginning with lush green fields rising through numerous angelic waterfalls and culminating in snow capped peaks that look like the hand of god has turned upside down and dunked, gingerly, in a bowl of icing sugar like snow. When you reach the top of Treble Cone you realise how lucky you are, lucky to find yourself in one of the world’s most beautiful places.Treble Cone (TC as it’s known locally) is considered “The Skiers’ Mountain” by its boosters because it boasts what is considered New Zealand’s best terrain and the most vertical of any New Zealand ski resort. I can testify that the terrain is awesome. It has super big and long natural half-pipes, big mountain chutes and powder. 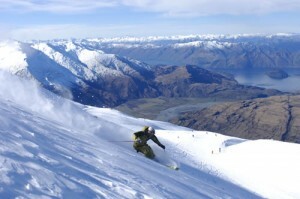 TC also provides for the novice with a four kilometre run of gentle terrain to its base lodge. It does not have the kind of lift capacity you might expect as a Whistler rider. There are only two lifts, unless you include the Button lift and the Magic Carpet, but one of the lifts is a “Six Pack” – that’s right, a six passenger chair which makes for some interesting lift lines. Amazingly, for the normally well-mannered Kiwis, they haven’t figured out the alternating lift corral etiquette we seem to have mastered in Whistler. (“After you.” “Oh no, after you.”) It’s more reminiscent of the crazy free-for-all Rugby Game and shoving match you might find at European resorts, except without the Germans in fur headbands shouting some variation of “lipshun warten bitter” – which means something like “wait for me darling” – to their bratty kids that just stomped across your skis. In New Zealand they call the ski hills “ski fields” because runs and resorts are marked by fences (just like sheep fences) instead of trees. The entire ski area is above the tree line which is beautiful when it’s sunny but murder when fog sets in and there’s nothing to use for contrast. Not only is the riding at Treble Cone truly world class, but you’ll see some excellent freesking and freeriding going on as well, and you can also witness some of the world’s best ski racers as the Austrians and Americans frequently use TC as their summer training facility. The amenities you find at TC unfortunately are a little less than what we’re accustomed to. There is one small day lodge at the base and it will remind you of skiing back in the ’80s with boot bags, shoes and back packs all over the floor of the cafeteria. Don’t ever complain again about Whistler prices either because you’ll be grateful for the $9.99 hamburger, fries and a drink combo – that particular meal at Treble Cone will set you back $18.50. Treble Cone is located about a 45-minute drive from the township of Wanaka (and 120 kilometres from Wanaka’s bigger, glitzier neighbour, Queenstown). It must also be noted that to describe the 45 minute drive as “white knuckle” would be a gross understatement. Your day at Treble Cone will be punctuated by a heart-pounding, sphincter-tightening drive up a winding dirt road with numerous switchbacks and several sections that are not wide enough for two vehicles. Oh, and no guardrails! It’s the kind of road that you would not think could exist in a western, industrialized country. If the parking lot wasn’t covered in mud, you would probably kiss it! Mercifully, there is a shuttle bus for guests who want to park at the bottom and on this trip two awesome bus drivers named Chris and Al kept your correspondent from being killed. If adventure, skiing and relaxing in beautiful mountain resorts with really cool people is your thing, then get your to do list and add Wanaka to it… put it right at the top.